I must have been living under a rock because I just found out that Yang Mi is a new mom. Crystal Liu, Yang Mi, Liu Shi Shi and Tang Yan all of which had a starring role in Chinese Paladin are four of the most beautiful faces dominating today's wuxia films and the most recent one to be in a relationship is Chinese actress Crystal Liu Yi Fei (born 1987) and Korean actor Song Seung Heon (born 1976). Both admitted to dating since May 2015 when they met during the filming of the movie called The Third Way of Love. Song Seung Heon rose to international stardom due to the 2000 k-drama Autumn In My Heart, which grew in popularity all over Asia spearheading what has become the Korean wave. He briefly dated Korean actress Sung Yuri but the two split up in 2003. Twelve years later and he finally found romance in Crystal Liu who is 11 years his junior. I seriously don't judge but I know 11 years might be quite substantial for some people. 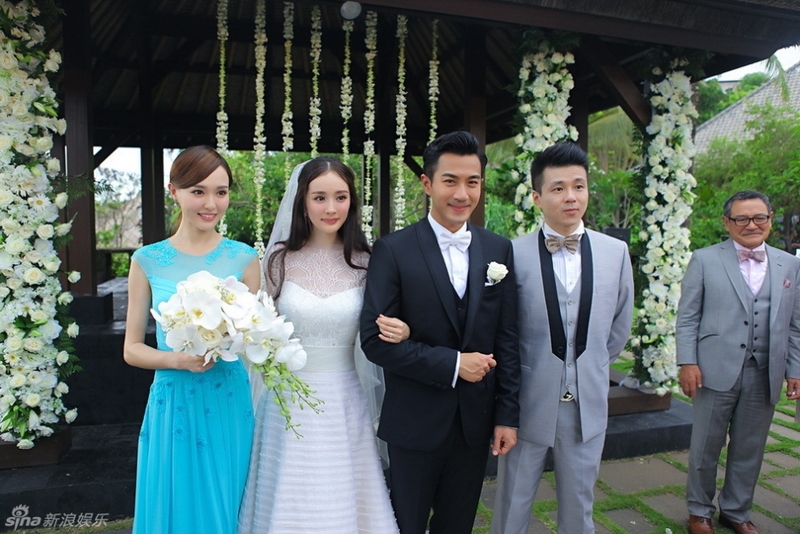 Yet lo and behold, there is another such example in Yang Mi (born 1986) and Hawick Lau (born 1974). I have never seen any of Hawick Lau's dramas but because he is playing the lead in one of my favorite wuxias The Legend of Flying Daggers, he is now on my radar. After dating for a few years, the couple tied the knot at a Bali wedding in 2014 and welcomed their baby girl in the same year. In case you didn't notice, Tang Yan was the maid of honor. Last but not the least is Liu Shi Shi (born 1987) who has been dating Nicky Wu (born 1970) since their popular TV series Startling By Each Step (Bu Bu Jing Xin) ended five years ago. Bu Bu Jing Xin was definitely a force to be reckoned with, garnering such a large viewership that it is going to be remade into a k-drama called Moon River starring none other than IU. As an avid fan, it is quite endearing to see the couple you root for actually get together in real life. The story of Si Ye (4th Prince) and Ruo Xi continues to this day as the power couple held a civil wedding back in 2015 and are preparing for the actual ceremony some time this year. They trump everyone else with a whopping 17-year difference, which goes to show that love knows no boundaries - neither language nor age.